393 Marlborough is located on the north side of Marlborough, between Hereford and Massachusetts Avenue, with 391 Marlborough to the east and 395 Marlborough to the west. 393 Marlborough was designed by architect Samuel D. Kelley and built in 1888 by John W. Shapleigh, builder, for speculative sale, one of three contiguous houses (393-395-397 Marlborough) designed as a single composition, with the central house (395 Marlborough) having a higher and more elaborate façade and the two flanking houses (393 and 397 Marlborough) being identical in design. John Shapleigh is shown as the owner of 393 Marlborough on the original building permit application, dated January 16, 1888, and on the final building inspection report, dated January 4, 1889. In his Houses of Boston’s Back Bay, Bainbridge Bunting erroneously states that 393-395-397 Marlborough were built in 1883. In fact, the land for the houses was not purchased by John Shapleigh until late 1887 and the original building permit applications for all three houses were filed in 1888. Bunting also does not attribute the buildings to a specific architect. However, the final building inspection report for 393 Marlborough indicates the architect was Samuel D. Kelley and includes a floor plan for the second floor labeled “383-395-397 Marlboro St – 1888” signed by Samuel Kelley. John Shapleigh purchased the land for 393-395-397 Beacon on November 23, 1887, from John B. Upton. 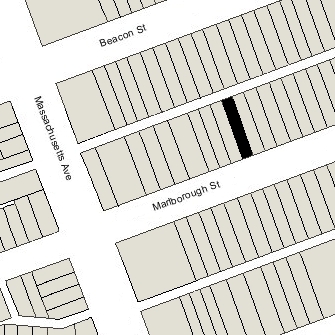 The lot was 65.42 feet in width, and on November 28, 1887, John Shapleigh purchased the additional 0.58 feet to the east, with half of the party wall with 391 Marlborough on it, from George Wheatland, Sr. The land originally had been intersected by Parker Street, a 60 foot wide street located on top of the Cross Dam, which ran southwest from Beacon at approximately a 45 degree angle, intersecting the north side of Marlborough at a point about 355 feet west of Hereford. The land to the east of Parker Street had been purchased on June 12, 1868, from the Boston Water Power Company by Daniel Davies, and the land to the west of Parker Street had been purchased from the company on March 1, 1872, by a real estate investment trust formed by Grenville T. W. Braman, Henry D. Hyde, and Frank W. Andrews. In the late 1870s, Parker Street was abandoned and Daniel Davies and the real estate investment trust jointly purchased the land under the roadway. Through a series of transactions, the owners traded triangular shaped lots to “square off” their holdings. The dividing line between the two parcels was 360.58 feet west of Hereford (resulting in the 0.58 foot lot which John Shapleigh ultimately purchased from George Wheatland, Sr.). Click here for and index to the deeds for 393 Marlborough, and click here for further information on the land on the north side of Marlborough between Hereford and Massachusetts Avenue. On April 25, 1889, 393 Marlborough was purchased from John Shapleigh by Emily Bentham (Fabian) Fall, the wife of attorney Charles Gershom Fall. They previously had lived in Malden. They also maintained a home in Cohasset. The Falls continued to live at 393 Marlborough during the 1894-1895 winter season but were living elsewhere during the next two seasons and 393 Marlborough probably was the home of merchant Benjamin Loring Young and his wife, Charlotte (Hubbard) Young. They previously had lived at 254 Beacon and were listed in the 1896 and 1897 Blue Books both at that address and at 393 Marlborough. They also maintained a home in Weston. They were not listed in the 1898 Blue Book and by the 1898-1899 winter season, they were living at 285 Beacon. By the 1897-1898 winter season, the Falls were living at 393 Marlborough once again. During the subsequent years, they frequently leased the house to others, traveling in Europe and elsewhere. Their son, Fabian Fall, attended schools in Tours, Dresden, and Berlin, and New College in Oxford, before entering Harvard in 1906. During the 1899-1900 winter season, 393 Marlborough was the home of Dr. Allen Melancthon Sumner, a physician, and his wife, Ellen Frances (Prescott) Sumner. In 1898, they had lived at The Empire at 333 Commonwealth. Their daughter, Margaret Bradlee Sumner, married in August of 1900 to Charles Claflin Davis, a trustee and future attorney. After their marriage, they lived at 393 Marlborough with her parents. Allen Sumner died in May of 1901, and Ellen Sumner and the Davises moved soon thereafter to the Hotel Cambridge at 483 Beacon. During the 1901-1902 winter season, 393 Marlborough was the home of Arthur Marsh Merriam and his wife, Margaret Elizabeth (Coleman) Merriam. During the previous season they had lived at 453 Marlborough. They also maintained a home in West Manchester. By the 1902-1903 season, they had moved to The Charlesgate at 535 Beacon. During the 1903-1903 winter season, the Falls were living at 393 Marlborough again, but by the next season it was the home of retired merchant Melancthon Woolsey Borland, a widower. He previously had lived at 445 Marlborough. He continued to live at 393 Marlborough in 1908, but had moved to 250 Beacon by 1909. By the 1908-1909 winter season, Charles and Emily Fall were living at 393 Marlborough again, joined by their son, Fabian, a student at Harvard, and Emily Fall’s sister, Cornelia Williams (Fabian) Worthington, the widow of Joseph Worthington. Mrs. Worthington’s usual residence was in Santa Barbara, California. Fabian Fall died in August of 1909, a suicide. The Falls and Cornelia Worthington moved from 393 Marlborough by the 1909-1910 season. By May of 1910, at the time of the 1910 US Census, the Falls were living with Mrs. Worthington in Santa Barbara. They subsequently traveled again to Europe for several years. During the 1909-1910 winter season, 393 Marlborough was the home of Francis Manning Stanwood and his wife, Louisa Blair (Rogers) Stanwood. They previously had lived at 250 Commonwealth. He was president of the Hotel and Railroad News Company, and formerly had been manager and editor of the Boston Journal. They also maintained a home in Manchester. By the 1910-1911 winter season, 393 Marlborough was the home of Harry H. Young and his wife, Lillian R. (Hoxie) Young. They previously had lived at 541 Commonwealth. He was a dealer in school supplies. They continued to live at 393 Marlborough during the 1913-1914 season, but moved thereafter to the Hotel Somerset. By the 1914-1915 winter season, Charles and Emily Fall had resumed living at 393 Marlborough. They continued to live there during the 1918-1919 season, after which they again traveled abroad. During the 1919-1920 winter season, 393 Marlborough was the home of Ward Thoron and his wife, Louisa Chapin (Hooper) Thoron. He was treasurer of the Merrimack Manufacturing Company, operators of textile mills, and formerly had been a lawyer in Washington, D. C. By 1921, they had moved to 46 Mt. Vernon, and by 1922 they were living at 294 Beacon. During the 1920-1921 winter season, 393 Marlborough was the home of retired investment banker, Harry Kent White, and his wife, Nora Bartley (Kent) White. They previously had lived at 37 Marlborough. They also maintained a home in Pepperell, Massachusetts. They had separated by 1922 and Harry White was living in Pepperell. 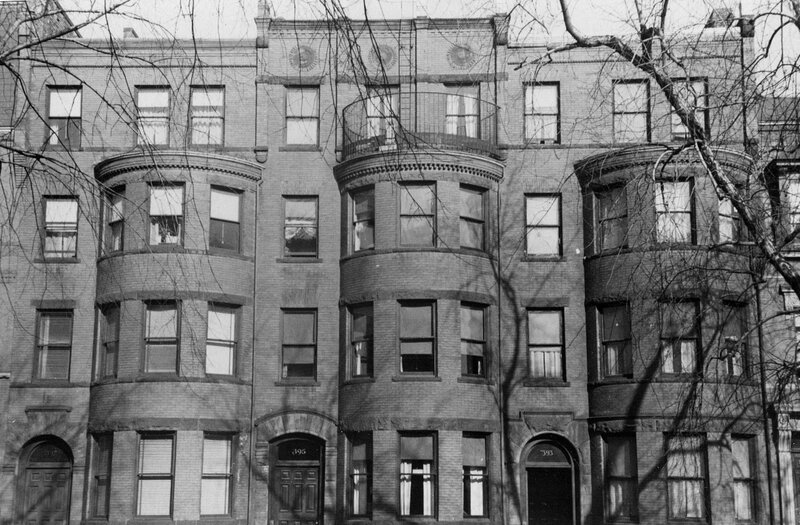 Nora White moved to an apartment at 186 Commonwealth and, by 1923, to 33 Gloucester. 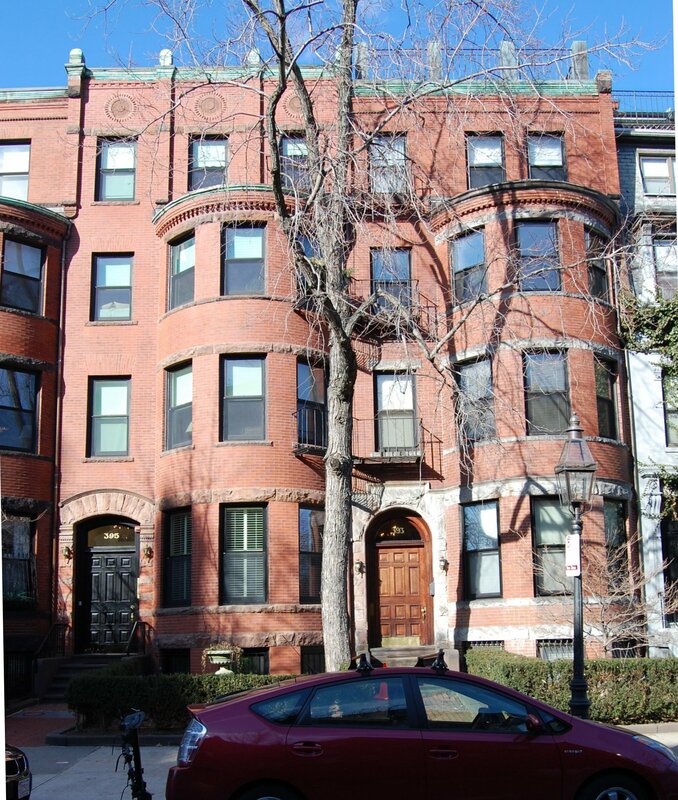 By the 1921-1922 winter season, 393 Marlborough was once again the home of Charles and Emily Fall. Charles Fall died in January of 1932. Emily Fall continued to live at 393 Marlborough until about 1933. The house was not listed in the 1933-1937 Blue Books, nor in the 1932-1937 Lists of Residents, and is shown as vacant in the 1934-1937 City Directories. On August 4, 1937, 393 Marlborough was acquired by Josephine (DePalma) Quattrocchi, the wife of Donato Quattrocchi, who operated it as a lodging house. They previously had lived at 30 Falmouth. He was a chef and in 1938 operated the Venice Restaurant at 82 Huntington. They continued to live at 393 Marlborough until about 1948. On March 31, 1948, 393 Marlborough was purchased from Josephine Quattrocchi by John D. Robuck and his wife, Mary Elizabeth (Kerr) Robuck, who operated it as a lodging house. They previously had lived at 851 Beacon. He was a student at Harvard Medical School and later would become a psychiatrist. On August 10, 1949, 393 Marlborough was acquired from the Robucks by George Edward Losier and his wife, Marion L. (Kells) Losier. They lived in Brookline. At about that time, it appears that the property was converted into apartments. It is listed as such in the 1949 and 1950 city directories, with eight units indicated. By the mid-1950s, the city directories indicated that there were twelve apartments. The legal occupancy appears to have remained a lodging house. On April 9, 1957, 393 Marlborough was acquired from the Losiers by Louis Di Giovanni as trustee of the Aloy Realty Trust. On May 1, 1958, he transferred the property to himself as trustee of the Trinity Realty Trust. On November 10, 1965, 393 Marlborough was acquired by Alfred J. Greenwood, a mechanical engineer who lived in an apartment at 212 Commonwealth. In January of 1985, he applied for (and subsequently received) permission to legalize the occupancy of 393 Marlborough as eight apartments, which he indicated was the existing condition. On February 1, 1985, 393 Marlborough was acquired from Alfred Greenwood by John R. Giles, trustee of the 393 Capitol Realty Trust. 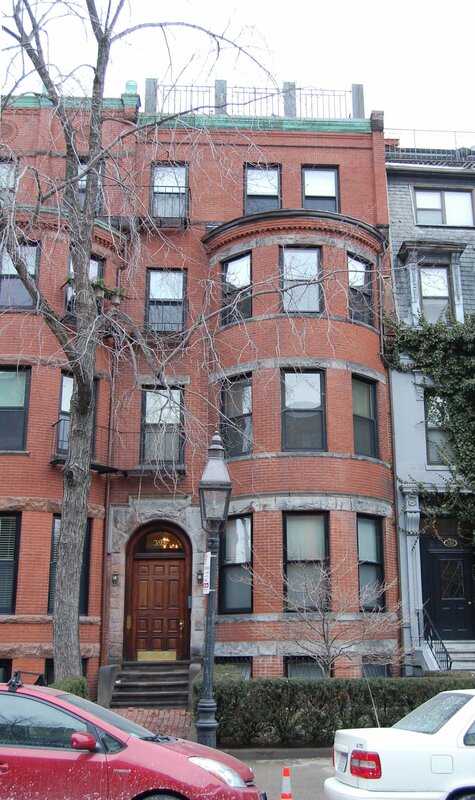 On August 21, 1985, he converted the property into eight condominium units, the 393 Marlborough St. Condominium.